John Jay Wells – The Future is Female! 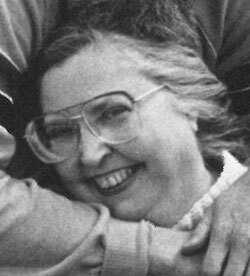 Juanita Coulson (co-author of “Another Rib” under the pseudonym John Jay Wells) circa mid-1980s. John Jay Wells (b. February 12, 1933), a pseudonym Juanita Coulson used only once, was born Juanita Ruth Wellons in Anderson, Indiana. Her parents Grant and Ruth (Omler) Wellons were both employed in a local auto parts factory. Coulson graduated from Anderson High School, where she worked on The X-Ray, a student newspaper. 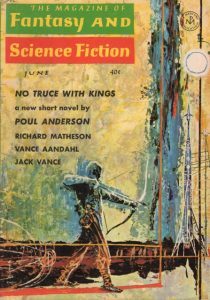 She was introduced to Robert Coulson at a meeting of the Eastern Indiana Science Fiction Association in 1953, and they married the following year; together, they published the fanzine Yandro (1953–86), winner of a 1965 Hugo Award for best amateur magazine. Graduating from Ball State University in 1954 and earning her master’s degree in education in 1961, Coulson briefly taught second grade; she had a son in 1957. Coulson was co-author with Marion Zimmer Bradley of “Another Rib,” published in The Magazine of Fantasy and Science Fiction in June 1963. This was Coulson’s first published story and the only time she employed the Wells pseudonym. The story “had a vaguely sexual theme, and the editor was a little nervous, it being 1963,” Coulson later recalled; “he thought that [it] needed masculine names on it.” After “Another Rib,” Coulson went on to write more than a dozen science fiction novels under her own name, beginning with Crisis on Cheiron (1967). Her most recent is Star Sister (1990). She has also published historical romance and mystery novels and some short fiction. After the death of her husband in 1999, she moved to London, Ohio, where she works part-time in the mayor’s office and attends “as many cons as money will allow.” An active filker (or sf-folk music performer) since the 1940s, she received the Pegasus Award for best filk writer/composer in 2012.